The Flip Side: Warm Welcomes and Wonky Wheels. Warm Welcomes and Wonky Wheels. This is a story about Kotido. Kotido is one of the airstrips that we fly to almost every time that we fly up into northern Uganda. It can also be one of the more challenging airstrips at times due to the tendency of those who maintain it to simply stop maintaining it. There are times when the long grass and termite mounds have forced us to stop flying there for a short time until some much needed maintenance has been carried out. Lately though, it has been taken care of quite nicely. 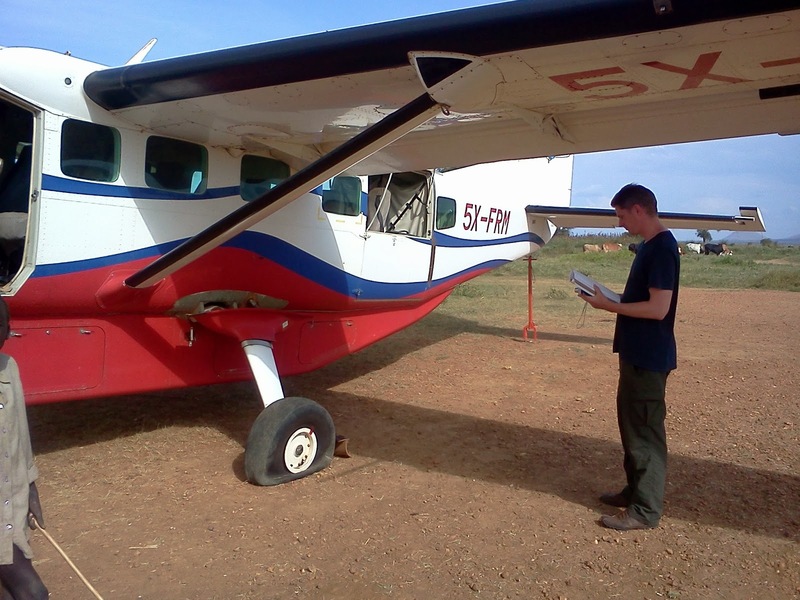 Last Friday, I was doing our northern Uganda shuttle flight. On this particular flight, I was carrying a group of people from the Netherlands who were here to do some filming for a documentary type video that they were producing for a charity that they work with here in Uganda. They were very excited to be here and as we lifted off and began the flight northward, the excitement continued to build in the airplane. They were very anxious to begin filming some of the countryside of Uganda as we flew, but unfortunately that morning there was a lot of rain in the area and as a result the excitement level began to drop as the poor visibility and rain didn't allow them to get any good shots. Our first stop on this day was at an airstrip that I had not been to before. Kidepo airstrip is almost all of the way north in Uganda, almost to South Sudan, and I needed to drop off one person there and pick up another before proceeding onward. Kidepo is located in one of Uganda's parks, and the scenery that greeted us was staggeringly beautiful. The flat grasslands of the valley spread out before us, with a range of mountains framing in the valley on either side. We all ended up outside the plane, just looking around and soaking in the beauty of this place before loading back up and heading onward to Kotido. The flight from Kidepo to Kotido was only just over 20 minutes, and before long we were taxiing into the parking area at Kotido. There are many days that pass when we do our flying and there isn't anything too different or exceedingly noteworthy about the day, but on this day we were greeted by a fairly large group of people who were very excited to greet the team that I had brought up. I always enjoy it when I shut down my engine and climb out to the sounds of singing, dancing, general excitement and merry making. I've wondered if I'll ever get used to it, but so far it never fails to bring a smile to my face and it always makes an already good day even better. After spending a couple of minutes taking the short video below, I climbed back into my aircraft and finished my day. That's the first "Kotido story" that I'd like to share about. The second one happened only yesterday. Yesterday morning, as I was driving to Kajjansi airfield, the sun began peeking over the horizon with the promise of a good day. The suns early morning rays revealed a cloudless sky and illuminated the country of Uganda in a way that only those early morning sunbeams seems to be capable of doing. My pre-flight checks on my airplane went well and all of my passengers were on time. Before long we were climbing up over the city of Kampala as I turned the aircraft northeastward towards Soroti. Soroti is one of three paved runways in Uganda, and I always feel a little bit spoiled whenever I land there. I had one fellow Canadian to pick up there, destined for Kampala, and then we were off and on our way to Moroto. I should explain something about our shuttle flights in northern Uganda. These shuttle flights are not charter flights, and people are able to pay for one seat only, which makes it much much more affordable for them. One result of this is that those who are picked up on the first or second stops of the day usually end up riding around Uganda with me for a few hours before we make our way back to Kampala. Passengers who regularly ride our shuttle flights all hope that their stop will be the first one of the day if they are on their way north, and the last stop of the day if they are on their way back to Kampala. For this first passenger, if she had been the last stop of the day she would have had a short one hour flight, but because of the routing that day she was the first and as a result she was going to get the grand tour of northern Uganda before we got back to Kajjansi. Landing in Moroto, I said goodbye to 4 passengers and welcomed 2 others onto my plane while we took on enough fuel to make it the rest of the way home. Taking fuel on up-country is actually a fairly efficient thing, and before long we were taxiing back down the red earth airstrip and then lifting off into the sky. After a short 18 minute flight we found ourselves overhead Kotido airstrip. A quick look downwards showed me that there was no cattle, goats or sheep on the airstrip (a common occurrence here), and that it was in fine shape to land. I set up for a landing into the wind, and managed to "grease it on". I let the nose wheel down onto the ground and brought the power lever back into beta range to help me slow down faster. As we slowed down, I began to feel the airplane pulling to the left. It was the same kind of feeling as that I've had before when landing on a runway where one side is softer, and the soft mud pulls you to the side (Also similar to a snowy country road in the Canadian winter). I thought that the thicker grass on that side of the airstrip was pulling me sideways, so I increased right rudder to keep myself from being pulled further to the side. As I slowed down further, the pull to the left increased to the point that I had almost full right rudder input to keep myself going in a straight line. Somewhere in that time my brain began to understand what was happening. 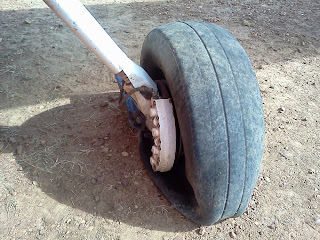 I had a flat main tire on the left hand side of my plane. A quick glance down through my pilots side window showed me that I was correct. I had now slowed to a safe speed, and quickly parked my plane, then keyed my mike to let our flight follower know what had happened. We'd be here for a while. After shutting down, I turned around in my seat and let my passengers know what was happening. I suggested that they head on into the town to find something to eat and to pass some time out of the baking sun at the airstrip. I would stay behind to look after my crippled airplane. In the space of a few minutes I was left behind with only my plane for company, as well as about 30 to 40 people from the small mud hut village located next to the runway (none of whom spoke a word of English). These people spend most of their day trying to find ways to fill the day, and here right in front of them was not only an airplane, but one with a problem! What excitement! They gathered around and peered through the open doors into my plane, looking at everything they could lay their eyes on. Buttons, knobs, screens, even the seats and floor came under their scrutiny as they strained their eyes to see everything that was to be seen. I was sitting in my pilots seat, trying to manage the situation as best as I could. Those African villagers love to touch, and there are a lot of things on a plane that shouldn't be handled, forcing me to find a balance between letting them look and making sure that nothing was damaged. While waiting for the plane to come and rescue us, I spent some time reading my kindle. At one point there was a little group of 5 boys who came up to the door of the airplane and looked inside. After a few minutes, I realized that they were on longer looking at the plane, but they were looking at something on me. I didn't want to scare them off, so I moved only my eyes to try and find out what they were finding to be so fascinating about me. I quickly determined that they were looking at my wristwatch. They were absolutely transfixed by the movement of the second hand as it made its way in its never ending circle around the face of the watch. I couldn't help smiling as for the next 10 minutes or so those boys stood there motionless and tapped their fingers on the side of the plane to the timing of the second hand. I wished that I could communicate better with them, but instead just sat and let them enjoy this curiosity. I wonder if they had ever seen a watch before. Finally I received word that the rescue plane was on its way out. Only minutes after taking off, the plane had a problem with one instrument and was forced to return and land at Kajjansi for a short repair. It was at this point that I realized that it was entirely possible that I might be spending my night in Kotido. And I waited. There isn't really too much that I can say to describe the waiting, but after 5 hours of waiting we finally perked our heads up to the glorious rumbling of the piston power of the Cessna 206 engine. There was no time to waste. I had to take off within the next hour or I wouldn't be able to make it home before the time limitations of darkness. We changed the tire as quickly as possible, and literally at the last possible minute lifted back into the evening skies of Uganda. The flight back to Kajjansi went by uneventfully, and thirteen and a half hours after walking through my gate that morning, I walked back through it that evening. It's been a long day when our night guard lets me out in the morning and is there to let me back in that evening. So is it all worth it? Absolutely. Waiting for our plane to come and rescue us gave me a small glimpse of what many of the missionaries who we fly go through as they wait for my plane to appear in the skies above their place of ministry. I'm also very thankful that things went so well for me during the landing. It would have been very easy for it to go very, very bad, but God was faithful and kept us upright and in a (mostly) straight line. As has become habit for me, I thank you for your prayers for us and for MAF. God's hand of protection was clearly on us that day, and it was truly an answer to your prayers. Thank you.